What’s It About? After a bad blind date Jim (Sandler) and Lauren (Barrymore) find themselves stuck together at an African family resort. Despite initially resenting each other, their attraction begins to grow as their respective kids benefit from their relationship. Verdict: The concept of the story has all the makings of a great family drama; Jim is a widow and has three daughters who he’s trying to play both mum and dad to and Lauren is freshly divorced with the father of her two sons refusing to take an interest in their lives. After a terrible blind date between Jim and Lauren they hold nothing but resentment for one another, but when they find themselves thrust together at a family resort in Africa they realise the positive impact the other has on their children and discover that maybe they aren’t so mismatched after all. Sandler has the stronger story here, he plays his usual manchild character that the audience have come to expect from him but there is more heart and emotion at Jim’s core than usual. We discover that Jim’s wife died of cancer and it’s clear that neither he nor his daughters have fully come to terms with her death, which makes for some heartrending scenes that show the funny man’s sensitive side and will bring a lump to the throat of even the hardest viewers. On the other hand, Barrymore’s character is neurotic to the extent of parody with her older son harbouring a creepy obsession with his babysitter and her youngest having extensive anger issues over the fact that he isn’t very good at baseball. These ‘quirks’ in both the children are clearly designed to be funny and an attempt to balance the emotional heartache that comes from Jim’s background. However having the majority of the attempts at comedy come via Lauren and her family ends up being to the film’s detriment. 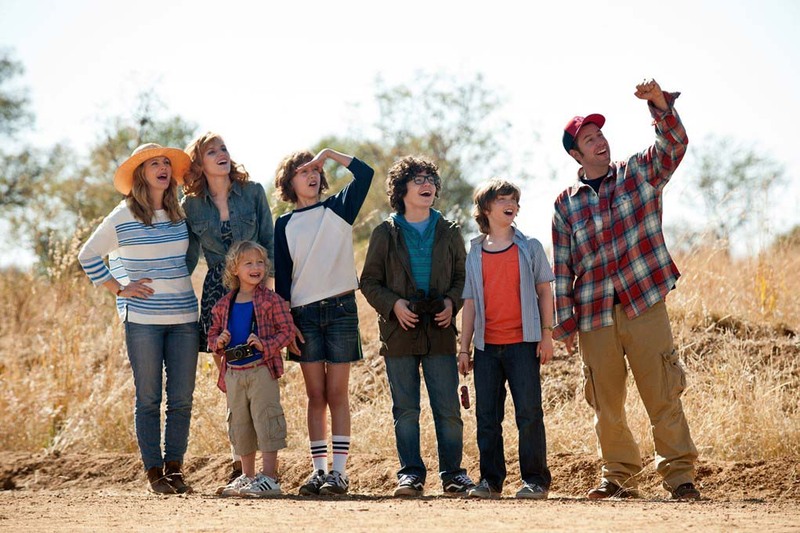 Blended would have been much better off as a family drama rather than a comedy, as that genre seems to have forced the film into throwing around slapstick and childish gags in a desperate attempt to make the audience laugh, seemingly without realising that subtle comedic undertones among the drama would have made for more pleasurable viewing all round. Sandler is yet again consistent and reliable for the genre and it is his character’s one-liners and dry wit that give some genuine funny moments to the film, whilst Barrymore and the supporting cast are left with the bigger gags that cheapen the film and take the focus off the heart and warmth at the story’s core. These jokes feel like they’re taken from a bad Carry-On film with children swearing, food being spluttered all over somebody’s face and sexual innuendos galore. Frustratingly, the basic storyline and character development of both Jim and Lauren and all of their children is at times gripping to watch and it is particularly endearing to see Jim’s relationships with his daughters grow as the film progresses. The attempts at comedy take away from what would have been a really brilliant drama and although there are aspects of Blended that are thoroughly enjoyable, the next bad gag is never too far away which ruins the overall tone of the film. Final Words: Blended has the makings of a strong family drama and it is unfortunate that the attempts at comedy take away from this. Adam Sandler was without a doubt given the stronger role in Jim, and his family provide the audience with genuine laughs, heartache, tears, and a warm fuzzy feeling whilst Barrymore and her children are left to struggle on with bad jokes and gimmicks. Sandler proves again prove that he’s more than able to give a serious and heartbreaking performance; it’s just a shame that Blended wasn’t brave enough to avoid his comedy safety net. Blended is in UK cinemas from 23 May 2014!